The biggest part of being a leader is to teach. If you don’t think you are a teacher you are fooling yourself. You are teaching every day to those around you even if you don’t realise it. Some mistakes I have seen repeatedly in my life is not letting people you are leading fail. And when they fail not giving them constructive feedback or helping them grow. How fair is it to expect someone giving it a go to be perfect and succeed the first time. Encourage, teach, give positive feedback and allow people to succeed in their failure. Give them second and tenth chances. So many people have given up because of the one chance they had that they blew and then never got chosen again. It is like that one child that wants to play sports but isn’t as great at the rest but you stick him on the side-lines because he is no good. Does he learn to play that way? NO! You work with him and give him a little extra help and you believe that he can do it. You echo his dream and build him up to meet it. You allow the team to build him up to and you don’t treat him like a failure you treat him like a learner. Failure and mistakes needs to be called learning because that is what it is. Learning because you don’t know how to do it yet but as you go and you see others do it you try and you try again and again until you have learned it and you have grown and embraced your dream and it is now a reality. Come on people. The reason why we have a world full of people who have buried dreams is because no one believed in them. They blew their one chance and were never asked again. They failed which means they were gifted or talented enough for their dream. Disqualified by lack of faith and unbelief. We need to trust people more and see their lives as an expression of the Creator. God made them and put that dream in them. He has given them that desire. Why not build each other up? Why not encourage and allow people to learn in their failure? Let God deal with the character and attitudes. Life will teach you enough without you jumping on everyone’s failures and faults. People are painfully aware of their faults and the things they hate about themselves. Why add to that? Why point out failures when we were called to love each other and build each other up and teach, encourage, prophecy, edify and pastor? Be very careful who you criticise and belittle because that person has a call on their lives and could be on the verge of quitting for good. They may just have been criticising themselves for 10 year and your words could bring confirmation or it could break that mindset and spur them on to good works. For years we have tried to control behaviour. Punishing people for their misdeeds and for stepping out of line. A world of rules and regulations that were meant to serve us has now only enslaved our minds and hearts. We have brought the lie into our lives that we are guilty until we are proven innocent. Yes there are some real criminals out there and my heart really breaks for those hearts that have been so hardened that they no longer feel anything for anyone and killing and harming is sport to them. We can only guess the reasons why they turned bad. I don’t feel like they were destined to be destructive and I think maybe the opposite was true that if they didn’t go very very mad then they may have been the very very best thing that happened to this world and maybe the enemy knew this and circumstances took over. It is just terrible seeing God’s creation broken and not functioning as it should. However let’s not treat each other as criminals first until they prove themselves. We are desperate for unity in the church but can I suggest that we stop trying to hustle unity and start working from unity. We are all one in Christ, brothers and sisters, family. We already in unity. It isn’t something we need to attain but it is something we need to live. 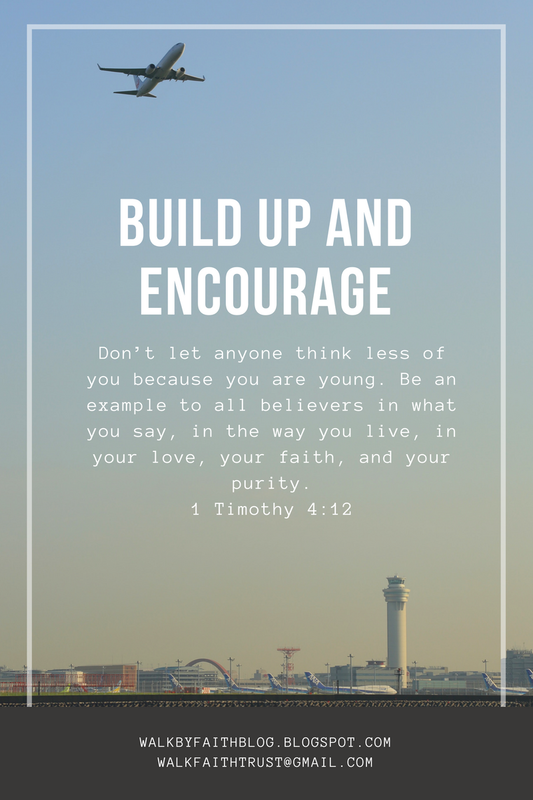 Why do you think Timothy was told not to let people look down on him for his youth? It doesn’t matter how old you are there is always someone older than you, looking down on you and ready to either teach you or discourage you. Which are you going to be? There is always someone younger than you, looking up to you to see if you will be open to teach or open to judgement. How will you teach and treat those around you today? Remember that God is judge and we are called to love Him and others as we love ourselves. 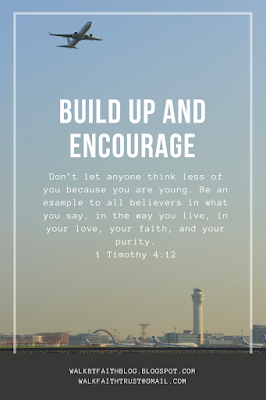 Challenge: Build up and encourage 3 people this week. Note the difference it makes in their lives and see if they grow more and step out a little bit more and become more courageous and brave. Come on you would want someone to do that for you too so why not let it start with you and maybe they will pay it forward.